Matlock Town boss Dave Frecklington said he “was buzzing” about his deadline day loan acquisition of Alfreton Town midfielder Callum Chettle for the rest of the season. The 22 year old is the son of former Nottingham Forest central defender Steve Chettle, leaving Forest for Ilkeston at fifteen years of age. He went up the pyramid as he joined Nuneaton Town in July 2015 after making 68 appearances for Ilkeston. Six months later Peterborough United paid an undisclosed fee for him and between 2016 and 2018 he made 18 appearances for The Posh. After going out on loan to AFC Fylde, Chettle joined Alfreton in a one year deal last summer and has since had a short loan spell at Boston United. “I’m absolutely delighted to get him , I’ve kept tabs on him for a long time” said Frecklington. 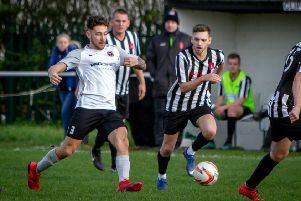 With Nathan Whitehead back from suspension for the home game with Basford United on Tuesday, and Greg Tempest, Cleveland Taylor and Marcus Marshall on the way back from injury and expected back in the squad soon, Frecklington was more optimistic about the rest of the campaign. “It’ll be like having five new signings, there’s only Craig King and Chris Salt who won’t be available now” Frecklington added. The Chettle deal was the only movement in or out from the Proctor Cars Stadium on the NPL transfer deadline day. Chettle will be included in the Gladiators squad for Saturday’s visit to Hednesford Town.